For those of you who regularly troubleshoot EMC issues, wouldn’t it be convenient to have all your “fix-it” parts all in one place? That’s what I thought as I was wandering around JoAnns (a fabric and hobby store) with my wife. 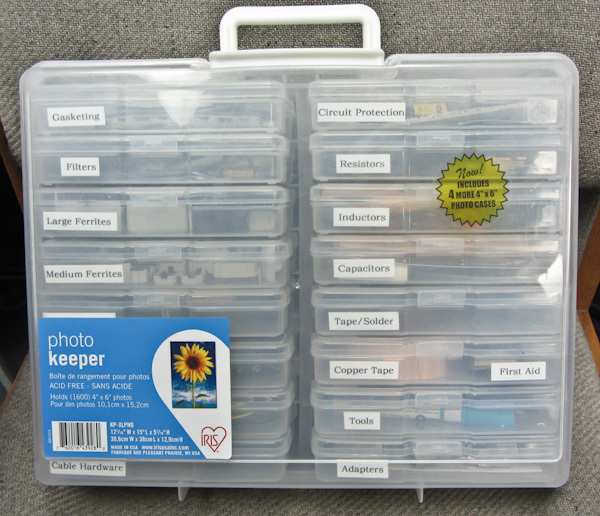 I spotted this “photo keeper” storage box and thought it would be perfect to store all the little parts, gasketing, filters, etc., for quickly implementing fixes during the troubleshooting process. I had a chance to use this kit in a real-life consulting application as I helped a client in Chicago recently. I transported the kit inside a large Pelican case and used a quantity of bubble-wrap to protect it from shifting around. It survived just fine and added a sense of professionalism in the client’s eyes. This entry was posted in General, Troubleshooting and tagged fixes, parts, troubleshooting. Bookmark the permalink.